“DON’T LET YOUR CHILDREN GO INTO CRIPPLING DEBT LIKE I HAVE!” I shout, as I and a group of students with SENS-UAW make our way to a major intersection just off Union Square. We wave signs, hoist our banner and merge into the crowd. We are protesting the new GOP tax bill, which will affect the lives of current, previous, and prospective students in critical and long-lasting ways. 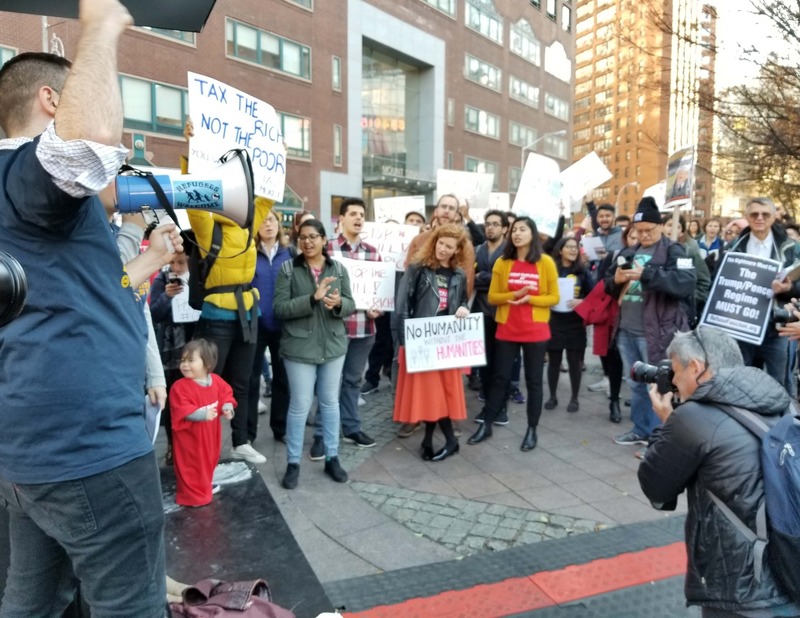 Early on Saturday morning, December 2nd 2017, the Republican Senate passed the new GOP Tax Bill, only days after students from across New York City joined together to protest it. While President Trump states that “people are going to be very, very happy,” students across the nation disagree. It will eliminate and tax credits for those students who use them to pay tuition along with any deductions of interest on student loans. To further twist the knife, the bill proposes to tax the tuition waivers received by students as part of their funding packages. This bill will triple, even quadruple, previous tax rates for students, increasing overall education costs. Many students, already in a financially precarious position, will be forced to leave higher education. Others will be unable to salvage the money to enroll and may never attend. For the many who still haven’t managed to pay off their student loans, the government has only made it a costlier, more painful and laborious process. Mention student loan debt in a room full of graduate students and it can be guaranteed that one will begin crying, on the inside at least. It is a touchy subject for many of us who feel uncomfortable, even foolish talking about their own experiences. This is something each of us should do, especially in light of the government’s new “solution” to the tax deficit. Student loans were not always the subject of tragedy. It used to be that only people able to afford university attended – supported by a scholarship, saved earnings, or, as was and still is often the case, familial support, inheritance, or traditional bribery in the form of “donations .” Admission to universities did not solely represent academic aptitude. There is no doubt that many capable people from previous generations were barred from entering the world of higher education. Student loans were introduced to (modestly) level the playing field by helping underrepresented students obtain university degrees. Hardly anyone in the present day has experienced that student loan narrative. Today, we still have student loans, but what was once meant to be a gleaming door to opportunity has become a gateway to crippling debt. A colleague and I walk over to a group of policemen, asking them what they think about the new tax bill. One officer states that what protesting students are doing is unnecessary. He didn’t need to finish his own college degree and even if he had wanted to, there are many affordable options. The only two options that readily come to his mind are the armed forces and the police academy. What he may have forgotten is why the armed forces offer to pay for undergraduate education in the first place, as the very means to attract new recruits. Recent education trends display a significant alteration in what is now considered a sufficient amount of education for the workplace. While only a few decades ago it was possible to get a fairly decent job after finishing high school, people today who are unable to obtain a college education are left at a much greater disadvantage in the contemporary job market. They suffer from less hiring opportunities, less upward mobility within positions, and much lower wages. It has become increasingly evident that undergraduate degrees have evolved into the new equivalent of a high school diploma, becoming a required credential on many resumes. Despite the fact that the majority of Western countries provide major assistance to their citizens obtaining degrees, the United States government has consistently refused to jump on the bandwagon for many decades. 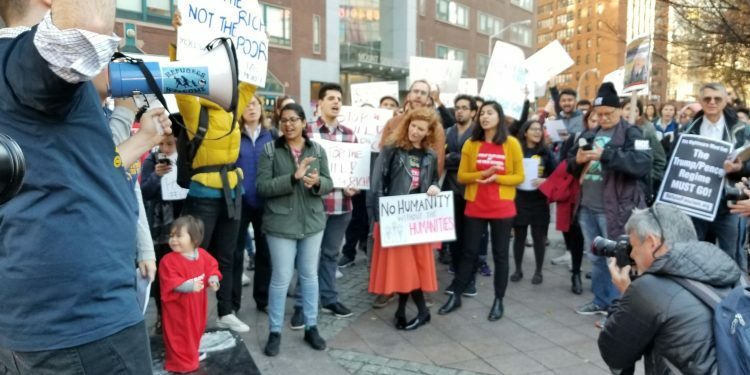 This brings us to the central issue that students and their families face today: students have become a cash cow of the American capitalist system, both in the private sector and the federal government. Today, student loan debt exceeds 1.4 trillion. These new tax protocols, courtesy of the GOP, enhance this exploitative relationship. My colleague and I listen to the policeman as he shares his disbelief that the government could possibly cause individual misfortune on such a massive scale, let alone intentionally. He declares that many of us students simply “fall in love with the campus,” biting off more education (and loans) than we can chew, instead of settling for those previously mentioned “affordable options.” He is stating what many have stated before: students in higher education are privileged and have no right to complain about what many see as self-imposed financial troubles. We have dug our own graves and the new tax will just be the final nail in our collective coffin. Hearing this, I begin to reflect on what a fellow student referred to as “the nasty intersection” of anti-intellectualism and classism that has contributed to this heinous tax bill. My colleague and I recount our own experiences to the policeman. I am shocked by how similar our stories are: both of us come from lower middle-class families who suffered under the recession. We both managed to pull things together, took out student loans, and went to college. Graduating in 2013, we were unable to find anything other than minimum wage jobs, moved back in with our parents, hoping to pay back our student loans. With our meager incomes, we were unable to make a dent in paying back our loans. In the end, we felt we had no choice but to return to school, make connections, earn experience, and obtain a new degree. That fresh degree and renewed hope in a brighter future came with more loans. Opportunities to make university “affordable” have become, and perhaps always were, a double-edged sword. In the end, many students are left desperately clutching their hard-won degrees while attempting to avoid the blade. It’s not a matter of being cut (you will be), it’s a matter of deepening the gash. Student loans haven’t made our universities affordable. They have just delayed the inevitable. We’ve signed our souls away to the federal government and bloated corporations in the hopes for a better life. Sadly, in the history of America, this is not new. The question is: whose dream trumps whose? The “American dream” arguably had its origins in the colonies. The North American continent was something of a utopian project for the many communities who travelled across the ocean to claim their portion of “unclaimed” land on which to build their shining “city upon a hill.” In the wake of “Thanksgiving,” I can’t help but reflect on the conflicting versions of the American dream and the many ways in which the freedom of the marginalized majority has always jeopardized the fulfillment of the elite’s dream. The pressing question is whose dream generated this tax bill and whose dream does it crush? “THIS IS CLASS WAR!” a woman shouts into the microphone. I ask my fellow students what they think the new tax bill will mean for all of us. One woman brings attention to the dangers of elitism that are perpetuated and bolstered by the tax bill. This bill will make it increasingly difficult for people from the middle and lower classes to enter into higher education, banishing them from the academic sphere. The disappearance of the middle class is not a new concern, but the promulgation of this bill is the most prominent display of such an intent in recent years. The bill is not just about making money, it is also about removing the lower classes from spheres of influence available to those who can afford an education out of pocket. “HOW TO FIX THE DEFICIT? END THE WARS! TAX THE RICH! “THIS IS STRATEGIC DISTRIBUTION FROM THE BOTTOM UP!” Patrick Mokre, an economics student at the New School for Social Research, calls into the crowd. I discuss with another student how the tax bill targets those in need while accumulating more wealth for the upper classes. A theory has been circulating: the GOP donors gave the congressmen an ultimatum, threatening to pull funding from reelection campaigns unless the bill was passed. “It’s just another case of the rich trying to get richer,” the student states. He is currently applying to doctorate programs, but is no longer sure he will be able to afford it. When the elites are the only ones given access to higher education we are left with a thoroughly stratified society than we have yet to imagine in the modern world. This is a system based entirely upon the foundations of eurocentrism, sexism, racism and classism, encouraging only conformity and compliance. These are the same foundations of a history that America has yet to shake. This tax bill asks us to double down on it. The narrowing opportunities for a university education will not be based on merit. Access will depend on class, connections, and donations. The system will be anti-immigrant, as children without citizenship, and without access to loans, will struggle to pay for their education. It will become even more prejudiced against difference, as it discriminates against the very people who need access to higher education. Many people of color, women, LGBTQ+ individuals, single parents, disabled individuals, and immigrants will remain confined to the lower income brackets of our society. This tax bill will not only make it difficult to gain access to higher education, but more difficult to even conceive of the possibility of pursuing such vocations. Education programs will be further oriented toward careers which the corporate world deems “profitable,” and will stifle those deemed less profitable. Many students have already found that their institutions support, and. at the very least, are complicit with current capitalistic trends. If our universities sit back and comply with this new bill, the results will be harmful for students but also for the reputation of universities at large. One of the students I speak with suggests university compliance with the Bill will breed resentment among students, decreasing loyalty and respect for their institutions. What kind of intellectual work can possibly come out of a university that has ceased to defend the interests of the people from which it profits? In the short term, the bill will harm many, but in the long term it will become a threat to all. We must all begin to ask some very uncomfortable questions. How will this tax bill affect the general value placed on education in our society? More importantly, what of our collective future and the world that extends beyond the university? What will become of the many people the government will bar from higher education? I wonder if the armed forces will be putting out some more appealing, tax-free college education packages any time soon? If Universities and academics, as well as the many who wish for a higher education for themselves or for their children, want to be valued, action must be taken now! The institution does not exist without its students. The corporations don’t exist without their consumers. The government does not exist without its people. They need us, and they need our compliance to function. So, we protest, shout, boo, chant, but most importantly implore people not to consent, but to “STAND UP AND FIGHT BACK!” We demand an equal footing for opportunity and the right to an education for all. We demand an American dream that is meant to be realized by all! Amy Osika is a current graduate student in Historical Studies at the NSSR and holds a Master’s degree in Anthropology .